A Philadelphia judge denied rapper Meek Mill's request for bail on Monday. 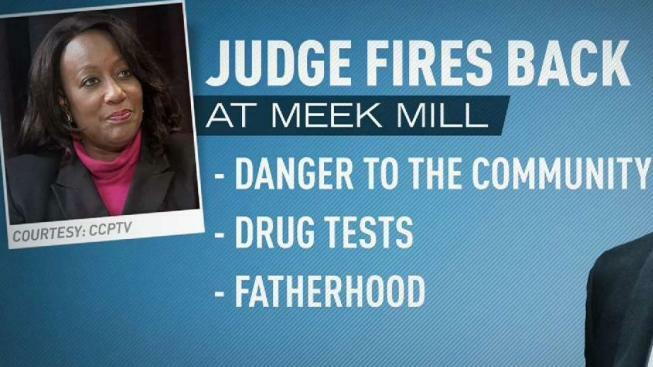 She says that Meek Mill is a danger to the community. NBC10's Deanna Durante has the story. A Philadelphia judge denied an emergency bail petition in a probation violation case against embattled rapper Meek Mill. In the opinion filed Friday and released Monday, Common Pleas Judge Genece Brinkley called him a "danger to the community" and a flight risk. It also detailed years of drug use and several probation violations dating back to 2007. "The defendant is not entitled to this sort of special treatment simply due to his 'celebrity status,'" Brinkley wrote. In response, lawyers for the rapper filed a new appeal with Pennsylvania's Superior Court on Monday. Mill's legal team filed appeals to have him freed on bail last month, and asked Brinkley to recuse herself after a nearly 10-year legal battle with the rapper. They cited an FBI investigation into her relationship with Philadelphia music mogul Charlie Mack, with whom she allegedly asked Mill to sign. Brinkley also allegedly asked Mill to record a BoyzIIMen song and include a reference to her, according to the investigation. "As stated on multiple occasions, he has never missed a previous court date in this case and poses absolutely no threat to the community, which makes him an ideal candidate for bail – a conclusion the Commonwealth did not oppose," Mill's attorney Joe Tacopina said in a statement Monday. "We intend to immediately appeal this decision, so Mr. Williams can be released from prison on bail while we continue to work to overturn this wrongful and unjust." Mill's attorneys tried to side-step Brinkley, who they claimed failed to respond to their motions, late last month by filing an emergency appeal with Pennsylvania Superior Court. The court quickly denied the motion saying the lower court needed to rule first, but did require Brinkley to quickly decide on the bail motion. Brinkley sentenced Mill in November to two to four years for violating his probation despite prosecutors recommending no jail time. His defense team alleged Brinkley made the case personal and assumed an "essentially prosecutorial" role. Mill was first arrested in 2007 on charges that included carrying a firearm without a license and selling crack cocaine to a police informant. He was found guilty two years later and sentenced to 11 to 23 months in prison with five years of probation. Recently, the Philadelphia native has become a national symbol for critics of criminal justice system. Celebrities such as Jay Z and several Sixers players have come out in his defense. On Friday, Embiid, Ben Simmons and Justin Anderson were photographed holding t-shirts that read "Stand with Meek Mill" at the Jay Z concert at the Wells Fargo Center. Jay Z's Roc Nation management company paid for billboards, which can be seen throughout Philadelphia and other nearby cities, calling for Mill's release from prison.